Squeaky Books: Guest Post: Caketastic! Hi everybody! Today, I'm very excited to be a featured guest for Enna Isilee's Birthday Celebration! My post is all about birthday cake. Cause let's face it, the cake is the best part of the day for me. I love all kinds of birthday cake, especially those that are unique and reflect the birthday person's personality. I've collected pictures of what I think are the most unique and original birthday cakes made that reveal aspects of my personality and inner self. The Phantom of the Opera is one of my all time favorite operas. I think the music is fantastic and I have soundtracks of several different productions, including the movie soundtrack. The story is engaging and intruging and pulls the viewer into it with it's interesting characters and the ghost story element. And the dancing and costumes! Enough said. This beach scene caught my eye not only because it is so elaborate, but because I love the beach and wish that I could be there right now. My dream house would be on (or near) a beach so that I could go lay on the sand anytime I wanted or take a dip in the ocean. 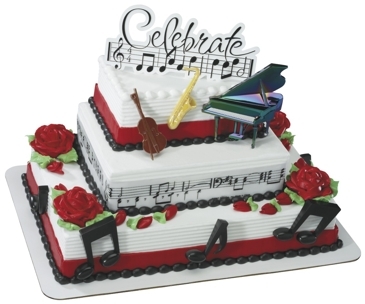 I like this cake because it features one of my favorite things besides reading and writing - music. I love listening to music and have an eclectic taste that includes rock, country, theater and soundtracks and some pop. I like discovering new groups and singers and have different playlists for different occaisions. I also like to perform karaoke. I'm no American Idol, but it's nice to go out with friends and just have fun performing and listening to others. Finally, I had to include a cake made of books! Not just because I am an avid reader and it is my favorite pastime, but also because this cake happens to feature some of my all time, much loved books. I hope you enjoyed by homage to birthday cakes. 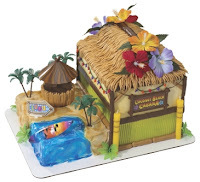 I'd love to hear about what kind of decorated birthday cake would best represent you! And I want to wish Enna a HAPPY BIRTHDAY! I hope you have a great day and a wonderful year to follow.